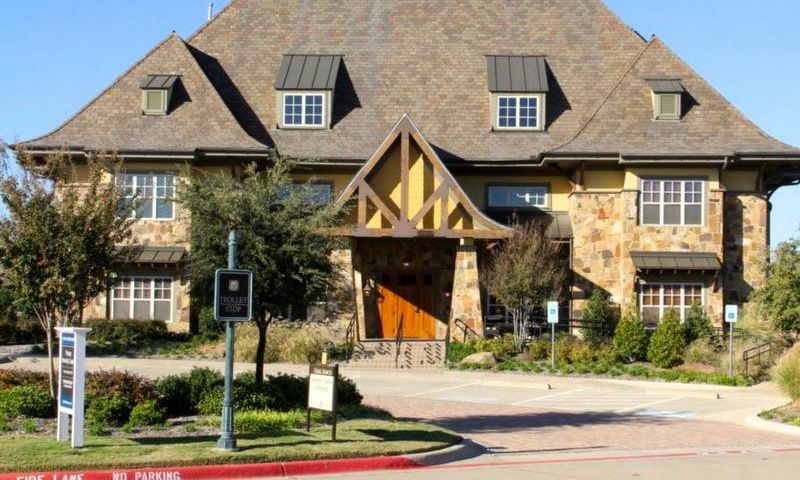 The Retreat at Craig Ranch is an active, non-age restricted community in McKinney, Texas. The lifestyle and state-of-the-art amenities appeal to a wide range of discerning homebuyers. Surrounded by plenty of green spaces, The Retreat is part of the unique, master-planned golf course community of Craig Ranch which was built around a town center to facilitate friendships. Not only do wide walkways and narrow streets create a pedestrian-friendly atmosphere, but a vintage trolley bus shuttles residents wherever they want to go within the community to reduce automobile use. While residents of The Retreat have access to the world class 18-hole golf course, the trolley, and all of the venues at the town center, they also have their own designated clubhouse and pool. With 9,000 square feet, the two-story clubhouse is a surprisingly spacious activity hub reserved exclusively for residents of The Retreat at Craig Ranch. Here, it's easy to partake in a daily fitness routine in the exercise room or gather with friends in the billiard room or social space. This exclusive clubhouse also offers a hobby room and catering kitchen. Outdoors, residents enjoy access to an outdoor pool, patio, and playground. Residents also have access to the Cooper Aerobics and Fitness Center, featuring 75,000 square feet of space. Indoors, there is a state-of-the-art fitness center, aerobics and dance studio, and a walking track. Challenge a friend on the basketball court before relaxing in the day spa. Locker rooms are available for homeowner convenience. Outdoors, there is an expansive pool and patio and a volleyball court. Homeowners also have access to all amenities and other venues at Craig Ranch which include a hospital, soccer fields, as well as the town center's stores and restaurants. All residential areas of The Retreat at Craig Ranch are connected with all these destinations as well as the other residential neighborhoods of Craig Ranch via a widespread community trail system. Designed by Tom Weiskopf with gently rolling hills, the TPC Craig Ranch Golf Course beautifully enhances the mature woods and banks of Rowlett Creek and tests the skills of players of all levels. This highly acclaimed par-72 course includes a short game practice area, dual-ended driving range, and putting greens. Membership is exclusive to residents of all Craig Ranch developments. There are two home series offered within The Retreat at Craig Ranch: the Villas and Estates. The Energy-Star certified Villas provide between 1,527 and 2,459 square feet of air conditioned space. Homes typically offer two to three bedrooms, two or two-and-a-half bathrooms, and an attached two-car garage. Entry ways, studies, family rooms, and kitchens all have hardwood floors. All kitchens appeal to distinguished chefs with 42-inch raised panel maple cabinets and upgraded granite counter tops. The luxurious bathrooms feature ceramic tile floors, marble vanity tops with over-sized mirrors, and ceramic tile shower surrounds and enclosures. All exteriors include concrete driveways and patios. The Estates is the latest collection offered in The Retreat at Craig Ranch. These homes offer 2,321 or 2,495 square feet with three bedrooms, two-and-a-half or three-and-a-half bathrooms, and an attached two or two-and-a-half-car garage. The Retreat at Craig Ranch is located in McKinney, Texas in the desirable Dallas-Forth Worth Area. The Retreat at Craig Ranch is the perfect community for downsizing without sacrificing on quality, luxury and privacy. Here, residents can experience a true pedestrian-friendly lifestyle in a country club setting. Old world charm rules, where people still come together on public squares and corner stores, yet, The Retreat at Craig Ranch still maintains all the necessary touches of modern life. Situated at Highway 121, The Retreat at Craig Ranch is positioned in the northeast portion of Colin County in one of the most desirable real estate growth areas in the US. It is part of the larger community of Craig Ranch. McKinney is a shopper's paradise with the Fairview Mall, Stonebriar Mall, and Allen Premium Outlet Mall all in proximity to Craig Ranch. If residents want to explore golf outside the community, they can choose from over 25 courses in a 20 minute radius. Popular attractions in McKinney include the Collin County Farm Museum, the Garrett Art Gallery, and the Heard Natural Science Museum and Wildlife Sanctuary. Dallas - Fort Worth International Airport can be reached within 45 minutes, while the cities of Dallas and Fort Worth are 30 and 50 miles away from the community respectively. The Retreat at Craig Ranch is a beautiful active lifestyle community to call home near Dallas, TX. Retreat Clubhouse - 9,000 Sq. Ft. The Cooper Aerobics Center &amp; Spa has everything needed to stay physically active. Clubhouse - 75,000 Sq. Ft. There are plenty of activities available in The Retreat at Craig Ranch. Here is a sample of some of the clubs, activities and classes offered here. The Energy-Star certified McKinney homes at The Retreat at Craig Ranch provide between 1,527 and 2,459 square feet of air conditioned space. Entry ways, studies, family rooms, and kitchens all have hardwood floors. All kitchens appeal to distinguished chefs with 42-inch raised panel maple cabinets and upgraded granite counter tops. The luxurious bathrooms feature ceramic tile floors, cultures marble vanity tops with over-sized mirrors, and ceramic tile shower surrounds and enclosures. All exteriors include concrete driveways and patios. My husband and I purchased a home here right after the community opened and we've loved making the move here. The amenities are outstanding! We both golf so having the course close by is great, the fitness center has given us new motivation to live a healthier lifestyle and we give ourselves spa perks when we keep going on our fitness routine. The quality of all the amenities here makes it really easy to want to be active rather than sit at home. It's a fantastic neighborhood and we've recommended it to lots of people, a few of who have also purchased homes here and are very happy. 55places.com is not affiliated with the developer(s) or homeowners association of The Retreat at Craig Ranch. The information you submit is distributed to a 55places.com Partner Agent, who is a licensed real estate agent. The information regarding The Retreat at Craig Ranch has not been verified or approved by the developer or homeowners association. Please verify all information prior to purchasing. 55places.com is not responsible for any errors regarding the information displayed on this website.